Even if you are saddled with a small bathroom, there's no reason it can't be stylish. Here are five easy ways to add character and pizzazz to your bath this weekend. If the average person spends 30 minutes a day in the bathroom, and they live to age 75, they will spend 1.5 years in the bathroom during their lifetime. Even without that knowledge, doesn’t it seem worthwhile to do what you can to improve your bathroom’s look, feel, and practicality? 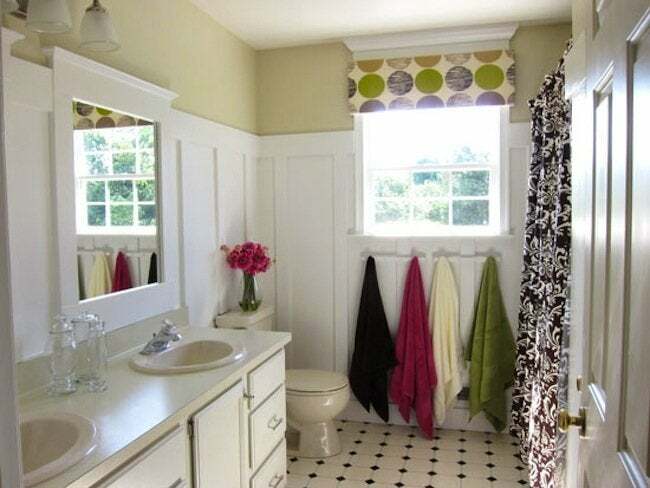 Here are five easy DIY bathroom ideas to inspire you and get you started this weekend. There are innumerable ways to use tile in the bathroom—and this clever bath upgrade is one more to add to the list. As important as mirrors are in the bath, they are often flat, frameless and lacking decorative panache. 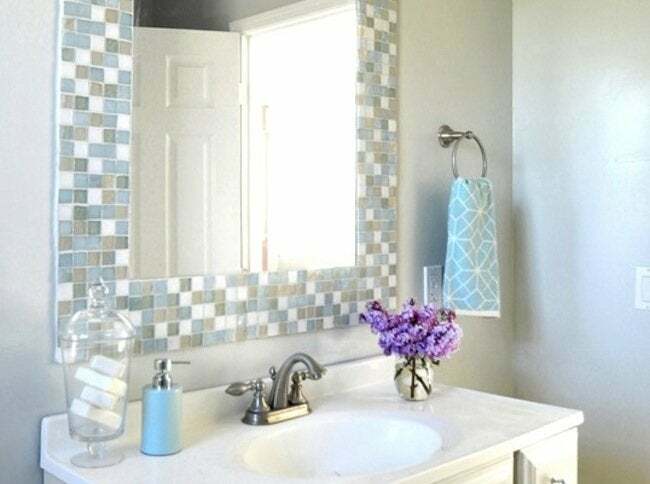 With some basic tools, a box of mosaic tiles, thin set mortar, grout—and determination, you can give your bath a decorative lift this weekend by creating your own mosaic mirror frame. 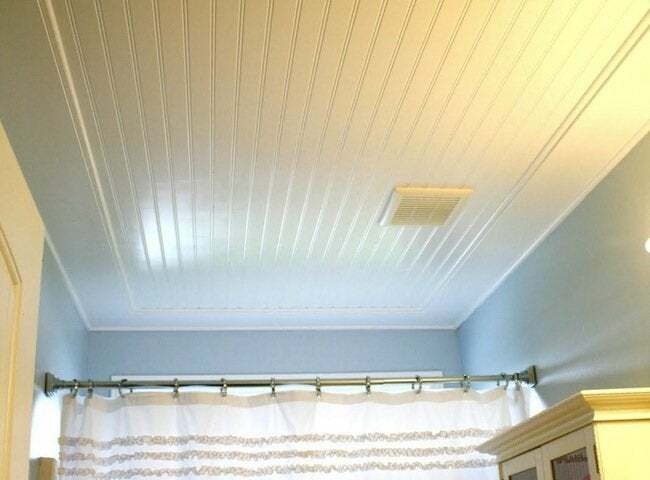 Here’s proof that even small rooms can benefit greatly from molding and decorative paneling. This board-and-batten wall treatment was installed using pre-primed MDF board, a saw, a tape measure, and some finishing nails. By aligning the horizontal rail to the top of the mirror and window, the bathroom takes on a more spacious appearance (and the look of custom woodworking). You can find a how-to tutorial here. Bathroom storage does not have to be relegated to only over-the-toilet-étagères and medicine cabinets. 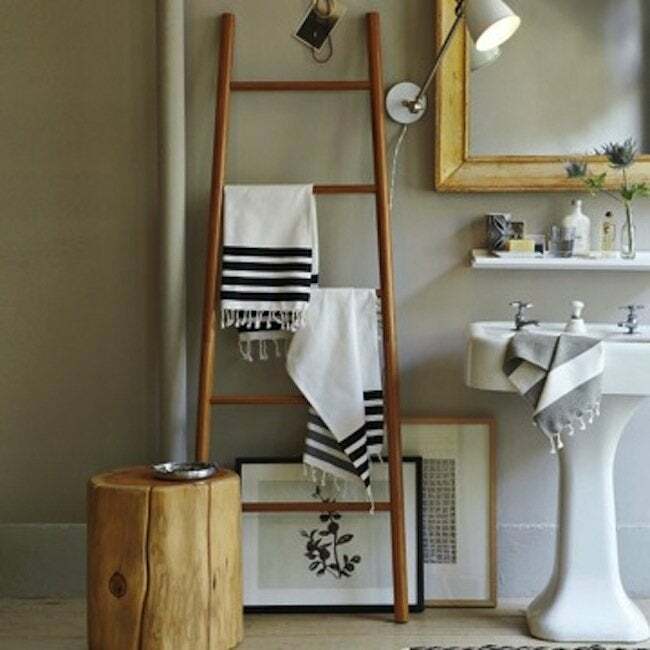 You can easily repurpose a vintage ladder to hold towels and magazines, or accessorize a coat rack to hang robes and bath towels. And don’t overlook the benefit of tall ceilings; a shelf above the door is an ideal spot for storing toilet paper and other less frequently used bath supplies. In a small room every surface can hold potential—even the ceiling. Draw inspiration from farmhouse and cottage-style designs by installing beadboard. Not only will it add character, it will give the entire room a more finished, professional look. While white is classic, there’s no reason not to consider a splash of color to give the breadboard some additional lift. 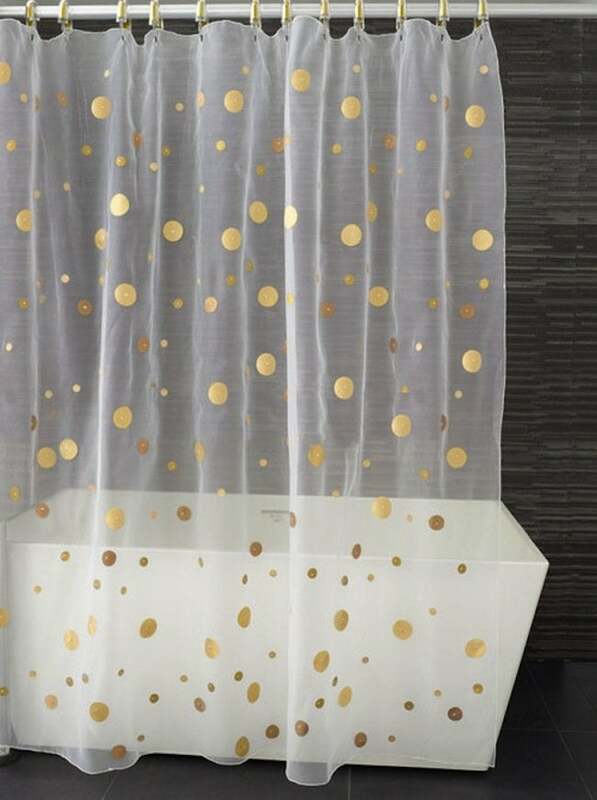 Not all shower curtains are beautiful—and not all beautiful shower curtains are affordable. Sidestep both obstacles by purchasing an inexpensive white or transparent curtain and decorate it yourself. Consider something as simple as this polka dot-decorated curtain (which the duo at Chiche & Chouette were able to recreate with an old beer bottle cork stamp and some fabric paint), or dress it up with some painted stripes. Let your skill level and imagination be your guide.